A fairly fast-paced day today with sabs in the field an hour before the hunt set off. Three setts were found blocked around an area called The Stanks and were unblocked by a sab. Three more were checked by another sab and were not blocked – one is very well known to us so tends not to be blocked so often anymore and the others are on land owned by someone who recently had a telling off for allowing sett-blocking to happen on his land. Whilst checking a sett by the meet at Manor Farm, a sab noticed suspicious behaviour in a nearby field… terriermen had put a terrier into a log pile in order to flush out a fox. Confronted, they hung around for some time then left as the rest of the hunt arrived. Hounds picked up on a scent and marked in a nearby badger sett – sab presence meant that this fox was left and huntsman Mark took the hounds on. A well-known hunt supporter received a call which sounded like a warning that sabs were out and watching! Hounds picked up again but lost the scent temporarily before spending a lot of time at the log pile. As they moved off a shout was heard and there was pointing and much excitement. But the clever fox had run across a field recently sprayed with slurry and hounds couldn’t find his scent. While one sab stayed inland others drove round to intercept the hunt as they headed towards Hillend. 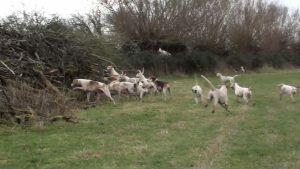 As hounds showed interest in and picked up a scent at another log pile and hedge huntsman was heard asking other hunt staff where the sab was – she was spotted and he took the hounds away from her once again. A few fields on and hounds went into full cry near Hillend, sabs at three good locations to intervene. 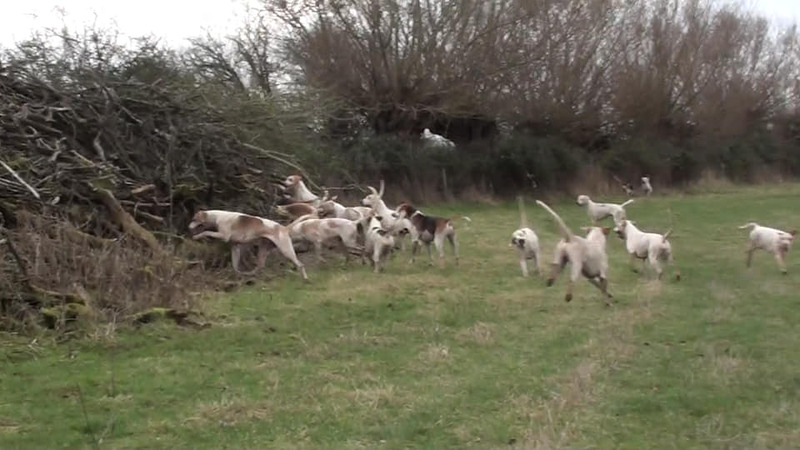 Then we heard rating and saw hounds being told off by some unknown people… odd, but fantastic. Hounds soon lost the scent in a covert – nearby badger sett was checked and was not blocked but a local artificial earth was definitely being used and had boot prints heading towards it. 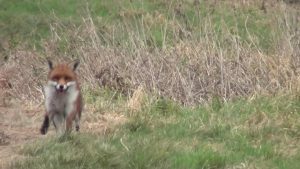 The hunt, now minus well-known ex-South Herefordshire Hunt Master Patrick Darling who went home looking bored, made a swift exit towards The Stanks and hounds soon picked up and chased a fox who ran towards sabs. As the fox crossed a main road a horn was heard being beeped, evidently in place of a holloa to alert huntsman to the sighting of the fox. We covered the scent and a sab remained nearby while others headed towards the hunt. Two holloas came from the road indicating another fox sighting until sab was spotted and ‘there’s an anti here!’ was heard. It turns out the guys who rated the hounds earlier are agents of a local landowner and the hunt had been trespassing on their land. Again. Having been told off (again) the hunt made a dash for it through The Stanks (where they’d been informed we had found the blocked setts) and hardly bothered even trying to hunt there. 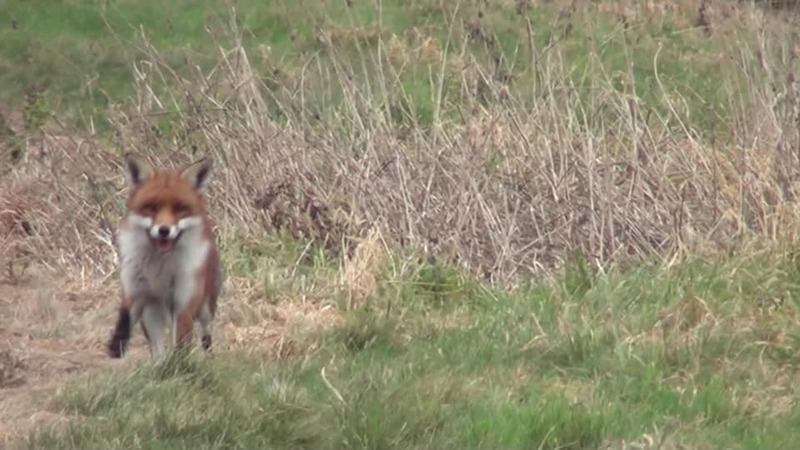 Looking at the footage we have, and double-checking with experts, this fox is a heavily pregnant vixen! The frustration was evident, especially when hunt supporters started to call us names (ranging from ‘riff raff’ to much worse) and sticking their fingers up at us while driving past. It only serves to show us that we’re having an effect on them. We soon found them hunting near Upton-upon-Severn and checked on a badger sett that we have caught terriermen digging out at on previous occasions. Sure enough we could hear voices as we approached and the terriermen’s quad bike exited the land in haste not long after. Then on to Holdfast Hall where supporters showed their obvious disappointment (‘oh, false alarm’) when someone accidentally beeped their horn and they had thought that a fox had been sighted… a real fox was then picked up on and chased towards a covert near Queenshill. Near another blocked sett. 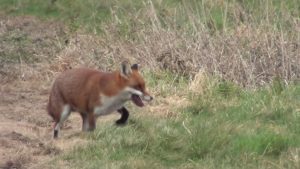 He was lost for some time but hounds were back on his scent soon after, between a main road and a motorway, the exhausted fox passing sabs on the road. He was flagging, confused and unsure about where to go, but cleverly covered his scent by circling around a steaming pile of manure.